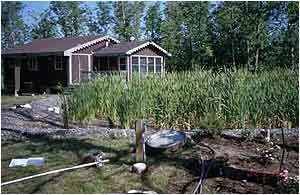 Constructed wetlands are one of many alternatives for on-site septic systems. Other alternatives include peat filters, sand filters, constructed wetlands, textile filters, aerobic treatment units (ATUs), and mound systems. Funded by the U.S. EPA, the NSFC helps America's small communities and homeowners solve their wastewater problems to protect public health and the environment. Residents of areas without access to sanitary sewers and municipal treatment plants own, operate, and maintain their own mini-treatment plants usually called septic systems, on-site sewage treatment system (on-sites), or individual sewage treatment systems (ISTSs). Residential onsite wastewater treatment in Minnesota is a large (about 500,000 residences representing about 30% of the population use onsite treatment), troublesome (nearly half may not comply with State rules or be failing), and contentious problem. Failing systems (called hydraulic failure) are those where the wastewater ponds on the surface instead of disappearing into the subsurface soil. Non-compliant systems may not adequately treat wastewater and pose a health risk due to pathogenic (disease-causing) microorganisms. Conventional systems, such as standard trenches or mounds, may work well by filtering out microbes to reduce disease risks, but are not designed for nutrient removal and may contribute to lake eutrophication and groundwater nitrate contamination. Contrary to general public perceptions, properly designed and maintained onsite systems may provide at least as effective a level of treatment as from a large municipal plant at an equal or lower cost. Since federal subsidies to municipalities have largely disappeared in recent years, many small communities are considering the onsite option. Because of reduced size, construction and maintenance costs, they may also be an important component of a comprehensive land use plan and provide a means to minimize the potentially rapid growth that may be associated with new or expanded treatment plants. Additional treatment capacity may be added between the septic tank and the final soil- dispersal. The restrictive site and soil conditions in the Northland present special challenges to standard soil-based treatment systems in unsewered areas. Particularly along lakeshores, lot sizes may be too small for effective treatment and/or the soils are too thin or too "tight" to allow the septic tank effluent to disperse without ponding on the surface. Compliance with State rules requires the drain field to have at least 3 feet of seasonally unsaturated soil but in some areas, particularly during spring snowmelt, the water table may be too high. A variety of so-called alternative systems now exist which may alleviate some of the waste disposal problems at these difficult sites where conventional drainfields are inadequate. They are also called "experimental", "pre-engineered", or "performance" systems, the latter two because they may be engineered to perform to a specified set of effluent standards as opposed to the one size fits all prescriptive approach of conventional systems. A University / multi-industry / local, state, and federal agency project was established in 1995 to design, construct, and monitor the performance of alternative treatment systems in Minnesota. Although the research program was largely terminated after 2001, results are available via the University of Minnesota Extension Onsite Sewage Treatment Program (OSTP) website (which contains lots of useful information). Northland results may be found under the "NRRI-UMD Technical Reports"	heading near the bottom of the Research page in the OSTP website. The research site is located at the Northeast Regional Correctional Center (NERCC). This project and the Grand Lake cluster-constructed wetland project were the product of a collaboration between the Natural Resources Research Institute, St. Louis County Health Department and WLSSD. Download a November 2004 report (PDF file -- 1.2 MB) that summarizes all of the performance data for the NERCC peat and sand filters and constructed wetlands. Grand Lake Cluster Collection System & Constructed Wetland Treatment System information may also be found at this website. This project linked 9 lakeshore homes having chronic wastewater problems to form their own Sanitary Sewer District with a common (cluster) collection system that delivered wastewater to a constructed wetland and seepage cell for effective treatment.